I got sucked into a MMORPG. I used to never play games, beyond simple puzzle and iPhone games, I just never had the time to play, and no real desire to invest the time. The last time I had played a computer game and cared about it, it was QUAKE II, back in the late 90s. I just don’t play games. Or at-least I didn’t. A few months ago we had some houseguests for about a week, and they kept talking about this ‘Lord Of The Rings Online’ game which they wanted Ami and I to try. I was actually pretty resistant to the idea because I really don’t have the time to spend playing an involved game like that, but they persuaded us to give it a try. Now I am hopelessly addicted. The biggest draw for me in this game is all about exploring and seeing the locations, the game designers really did an excellent job with this game. They put a lot of work into the locations, they feel authentic and each area does have its own feel and pace. A lot of similar games seem to lack that connection, and it really shows that the game designers are really fans of the master-work at heart. I especially like wandering and exploring, there are a lot of areas that have less to do with game-play and more with just awing someone who stumbles upon them. The ruins in the hills and the gorges and waterfalls make me want to go there in reality. Ever since watching the films, I have wanted to live in Rivendell, I love the half-outdoor half-indoor settings, and the way the leaves cover the walkways. I know most of that is just CGI, but imagine how wonderful it would be to really live in a place like that? The stone simplicity, the rushing water and the bite of the winter wind. the smell of the moss and lack of cars, busses and wagons. Imagine the quality of life if we could live like that? Using the natural world to make our homes, much like the birds and other wild creatures do. Stone is beautiful when if blends with the rest of the environment, and we are better people when we are connected to our environment and not isolated inside an air-conditioned, steel and glass box. 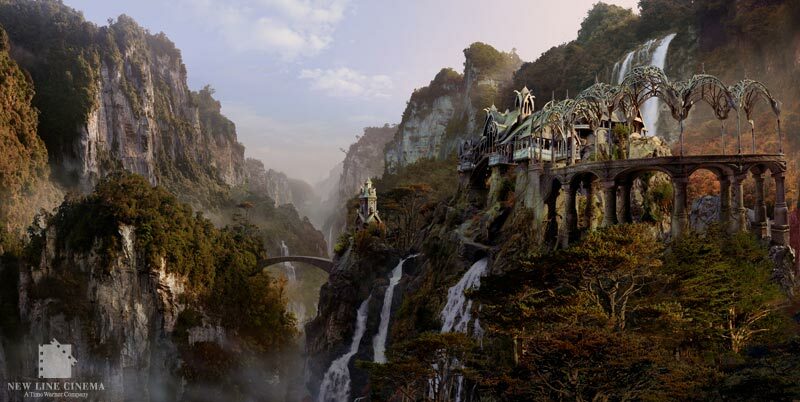 I want hobbit-houses and Rivendell style places to be real, and not just in the imagination. Why do we insist on living in a card-board existence and hiding ourselves away from the natural beauty that is all around in the woods, fields and mountains? The best fantasy is written in the language of dreams. It is alive as dreams are alive, more real than real .. for a moment at least … that long magic moment before we wake. Fantasy is silver and scarlet, indigo and azure, obsidian veined with gold and lapis lazuli. Reality is plywood and plastic, done up in mud brown and olive drab. Fantasy tastes of habaneros and honey, cinnamon and cloves, rare red meat and wines as sweet as summer. Reality is beans and tofu, and ashes at the end. Reality is the strip malls of Burbank, the smokestacks of Cleveland, a parking garage in Newark. Fantasy is the towers of Minas Tirith, the ancient stones of Gormenghast, the halls of Camelot. Fantasy flies on the wings of Icarus, reality on Southwest Airlines. Why do our dreams become so much smaller when they finally come true? We read fantasy to find the colors again, I think. To taste strong spices and hear the songs the sirens sang. There is something old and true in fantasy that speaks to something deep within us, to the child who dreamt that one day he would hunt the forests of the night, and feast beneath the hollow hills, and find a love to last forever somewhere south of Oz and north of Shangri-La. They can keep their heaven. When I die, I’d sooner go to middle Earth.